Remodeling your kitchen doesn’t have to be a nightmare. Here’s a step-by-step guide to the kitchen renovation process, including the planning process, deciding if you need to hire an architect or an engineer and when to start ripping up those old cabinets and countertops. Step 1: The planning process, decide what you need & want your renovated kitchen to include. The first step to a successful kitchen renovation involves deciding how you want/need the finished remodel to look and function. How many people use your kitchen on a regular basis, and how many people do you cook for? These questions help to determine overall needs, such as how big your refrigerator should be, as well as how much prep space and kitchen seating you require. Your kitchen ‘wants’ includes the overall style you see fitting in with your lifestyle and overall home décor. Start visiting local home improvement stores, thumbing through home magazines and sites like Pinterest in order to decide upon the style that speaks to you. Combine all of your wants and needs into two different lists and then decide what ranks highest importance and what you could live without. Get estimates and calculate the costs for everything on your lists. If you end up over budget, you can start shaving away things of less importance. You are always going to save money, time and hassles by keeping your kitchen’s general footprint. If you decide to move the sink or oven, you’ll need to include costs for an electrician and/or plumber. Taking down walls can also add considerable costs onto your remodel, and may require an architect. Step 2: Hire a designer and/or architect. Larger or more complicated remodeling projects may benefit from a designer and/or architect. An architect will create to-scale drawings of the kitchen you want within your intended space. This gives contractors something to work off of and helps you decide what is and isn’t realistic. A designer helps bring your vision to life by adding charm, style and functionality to your kitchen. They help pick out things like materials, accent pieces, appliances and color schemes to create a beautiful, cohesive and functional kitchen. Step 3: Obtain any necessary building permits. Depending on your local building codes you may need to secure building permits for your kitchen renovations. Investigate all of this before you start knocking down walls or buying slabs of granite. Step 4: Interview contractors and pick the best ones. If you plan to hire a general contractor to oversee your kitchen renovation, make sure to get several estimates before making any decisions. 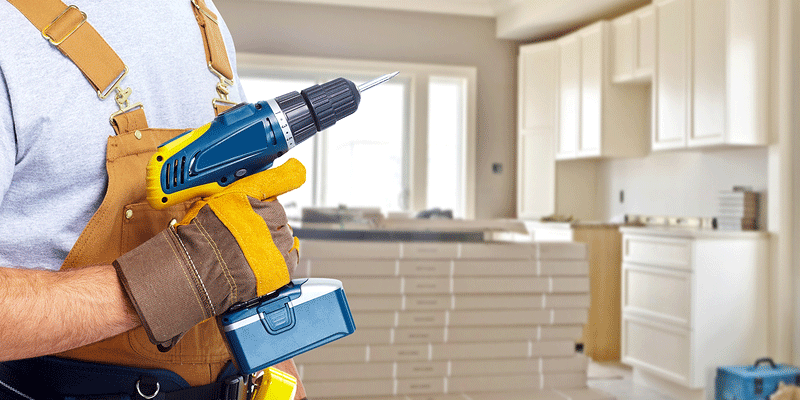 A general contractor will take care of hiring everyone from cabinet installers to painters. A general contractor may charge as much as 30% of the total cost of your remodel, but they work hard for this money by overseeing every last element of your remodel. General contractors often pay for themselves by saving you money on materials and sub contractors. They also save a lot of time and hassles. If you are not hiring a general contractor, it’s all on you to find the right contractor for every last task that needs to get done. There are a number of different contractors your remodel may require such as: a tile installer, drywaller, HVAC contractor, plumber, electrician, demolition crew, flooring installation and so forth. You’ve already figured out everything you want and need in Step 1 so you should have a good idea as to what contractors you’ll need to hire. Price alone cannot determine the quality of any contractor. Instead it’s about finding skilled people that understand your vision and have a good track record completing similar projects. Step 5: Shop for all materials. Once your kitchen is demolished you’ll want it back in one piece as soon as possible. By ordering all materials ahead of time you help prevent lengthy delays. Just make sure you order the right amount of materials by working with professionals and double-checking every last measurement. It’s always better to have a little too much than not enough. Shop around for the best deals on materials; you might be surprised how much the same slab of granite can vary in cost depending on where you purchase it. Shopping for wholesale materials at Tops Kitchen Cabinet and Granite can save you thousands of dollars on your remodel. Step 6: It’s finally time to demolish the kitchen. You’ll need a system in place for taking down the parts of your kitchen you plan to replace. For instance, if you’re taking down the cabinets, start by removing cabinet doors before removing the actual cabinets. You might be able to make a quick buck selling old cabinets on sites like Craigslist. You may also want to consider adding your old cabinets to your garage for additional storage. Step 7: Replace older plumbing. If you are replacing plumbing, now is the time to do that. With cabinets stripped out, the walls are open and ready for plumbing work. Step 8: Replace electrical work & install kitchen lighting. Add new kitchen lighting and replace old electrical work. You might want to consider upgrading your circuit breaker box to 200 amps. Step 9: Add kitchen drywall, mud and sand. Step 10: Paint kitchen walls & the ceiling. Step 11: Install kitchen flooring & baseboards. Step 12: Install kitchen cabinets. Step 13: Install kitchen countertops. Step 14: Install kitchen backsplash. Step 15: Install kitchen appliances, hardware, and accessories. Don’t throw your hard earned money out the window! You can score a luxury kitchen for less by buying wholesale countertops, cabinets and accessories from Tops Kitchen Cabinet and Granite.